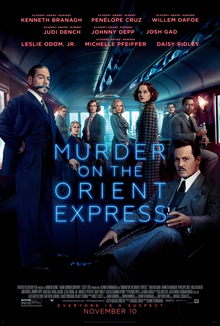 It’s been a while since Agatha Christie’s legendary Belgian detective Hercule Poirot has appeared on the big screen (1988 in fact), so Kenneth Branagh’s take on ‘Murder on the Orient Express’ presents the opportunity for a fresh take in front of a contemporary audience. The source material is one of Christie’s best loved novels and is arguably the best known out of those adapted for the cinema screen, with Albert Finney’s take on Poirot garnering an Oscar nomination, so the pressure was certainly on Branagh to produce a worthwhile adaptation. His approach is to take a more theatrical approach to the material, ramping up the campiness in both the dialogue and the performances (his own most notably) and for the most part, I felt it worked. I must confess my overall enjoyment of the movie was impacted by my memory recalling the ending about half way through the film (I’d seen the 1974 version years ago but couldn’t recall what the outcome was), so it was difficult to put that to the back of my mind the minute it jumped in. For those going in completely blind, I’d be intrigued to know at which point you solved the case, or if you had to wait for one of Poirot’s famous reveals towards the end! The setup of the film is very much as the title suggests, focusing on a murder that occurs on the wintry train journey from Istanbul to Calais on the Orient Express. It’s easy enough to identify the person who will be murdered from the collection of individuals who board the train, but the fun of any Christie novel or adaptation is in watching Poirot interrogate the potential suspects, poking holes in their stories and discovering clues that the ordinary viewer would easily miss. I enjoyed aspects of this but it felt a little clunky in execution and the revelations when they came felt rushed as Poirot raced around the train to provide each of the extensive, starry cast an opportunity to get involved. Branagh’s Poirot is a caricature with a phony accent (that I kind of got used too) and the most ridiculous moustache you’ve ever seen on screen, but I felt it worked because the tone of the film and Branagh’s approach to the character are very well matched. I think it helped that the supporting cast were mainly played straight (with one exception) which heightened the ridiculousness around the central character and really made him stand out as the eccentric detective that he is. I went into ‘Murder on the Orient Express’ expecting good fun over high art and for the most part, that’s what I got. It’s not a great film but it certainly has its charms, and if Kenneth Branagh wants to amass another cast of similar quality and tackle ‘Death on the Nile’ (a superior story) next year then I’m all on board for it!